So back to the party! As you may have heard, some sh*t went down, Spice got pushed out of The Bunker and has now moved to the Kings Cross Hotel. Lost Baggage is no more, those involved are doing their own separate things now as Finely Tuned, and Reckless Republic (who have teamed up with Future Entertainment/The Likes Of You). I don’t know the full story myself. Some words about it all on ITM here. Enjoy the music, let’s dance. 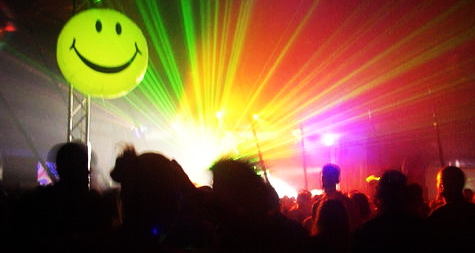 Also, the InTheMix – Sydney – What’s On section lists a whole range of electronic music events/club nights, check it out here. I’ve been eating Vegemite spread on toast (with butter) all my life, at least a few times every week. I had some this morning infact. I even took some away with me on holiday to the U.S.A last month too, that’s how dedicated to it I am. I didn’t want a repeat of the Vegemite withdrawals I had during my Europe holiday in 2007. 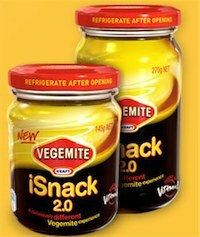 So, it’s all over the web… How could Kraft chose iSnack 2.0 as the winner for the ‘Name Me…’ competition, for the new cheese variety of Vegemite? It’s so lame. It has certainly generated a lot of talk and media attention, all focused on the horrible name though. It wouldn’t surprise me if it’s all a big P.R stunt. I wonder what it tastes like? I’ve never liked/understood the Vegemite with cheese thing myself. So with all that media attention, and public dissatisfaction, last week, Kraft dropped the iSnack 2.0 name, and asked the public to vote from one of the following (much more suitable/better) names… My vote is for Cheesybite. And today we have a winner… Vegemite Cheesybite it is! Although, thinking about it some more, calling it Cheesybite, for a smoother, creamy cheese version of Vegemite doesn’t really make sense. I’m still yet to taste this, I bought one of the ‘name me’ jars last week, having a quick look/smell I think I’ll be sticking to the original. I’ll report back on how it tastes. So I tried some of the new variety ‘Name Me…’ Vegemite, soon to be released as Cheesybite and… I don’t like it. It doesn’t have that salty bite/edge the original Vegemite has, which I think is what I most enjoy about it. I’m put off by the poo brown colour of the new variety, and it’s nowhere near as thick, sticky as the original. The new stuff spreads easier, but it feels/looks like spreading Nutella, which I’ve never been a fan of. So, I’m sticking with the original, and best! So this comedy event is coming in a couple of weeks. We’ve got tickets to the Saturday show. I’m looking forward to Alexei Sayle! It should be a blast! Nick Sun, Austen Tayshus, Heath Franklin’s Chopper, Akmal, Jimeoin, Tommy Dean, The Chaser’s Andrew Hansen & Julian Morrow, Anthony Ackroyd and a heap more!